Do you work smart? Do your employees and customers? Working smart is about choosing the best solution for energy efficiency challenges and then executing the project safely. All of Tiger Foam Insulation’s™ products are low pressure products meaning that the dispensed pressure is below 250 psi. High pressure foams are dispensed at 1,000 psi and above. However, like high pressure foams, Tiger Foam Insulation’s™ products contain diisocyanates. This chemical may cause sensitization by inhalation and skin contact. For this reason, when using any spray foams, our industry recommends following a safety program. All of Tiger Foam Insulation’s™ polyurethane foams should always be used in conjunction with a certified respiratory program in addition to safety glasses or goggles, nitrile gloves and clothing that protects from skin exposure. MSDS, TDS and Operating Instructions for our other products can be accessed in the Product Data Sheets section of tigerfoam.com. Tiger Foam Insulation™ products are for professional use only. Children should never use these products. Use the Tiger Foam Insulation™ products in well ventilated areas. If the jobsite is not ventilated, Tiger Foam Insulation™ recommends adding mechanical ventilation, or wearing a powered air purifying respirator (PAPR). Before the first use of the product, store in a room temperature, dry area. Do not expose the kit, cans or tanks to open flames or temperatures above 120 degrees F (49C). Warm the kits and cans for a minimum of 1 day at room temperature. During colder months it may take 2-3 days to warm up the chemicals to optimum temperature. Always agitate the cylinders well prior to use in order to thoroughly mix the chemicals and assure even chemical temperature. After initial use of spray foam kits, close the valves and store at room temperature. Do not drain or remove hoses as they should remain under pressure. Remaining kit should be used within 30 days of opening. Do not incinerate tanks. After tanks are empty, the hose should be removed and the tanks should be vented. Caution: Tanks will still be under pressure. Turn valves to the off position before removing the hoses. 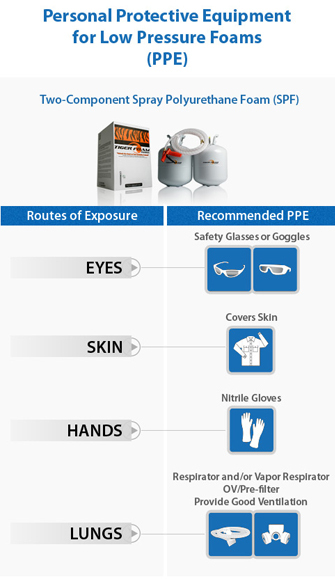 Protective glasses or goggles, nitrile gloves, clothing that protects from skin exposure and a certified respirator should be worn during this procedure. With tank inverted, slowly open tank valve, point away from face and allow pressure to completely vent. Caution: Empty tank could contain potential vapor toxicity hazard. Dispose cylinders in a well ventilated area. Dispose of empty cylinders according to applicable federal, state and local regulations. Check with your local waste disposal service for guidance. Have a well-insulated day and please call us if you have any questions at all. We welcome your inquiries and there are many ways of contacting us. Phone, Contact Form, or just ASK MR. FOAM – and get your project done with a great feeling of accomplishment when the results are more than you expected.